Ramadi falls to ISIS: The U.S. strategy in Iraq depends on a military that still doesn't exist. 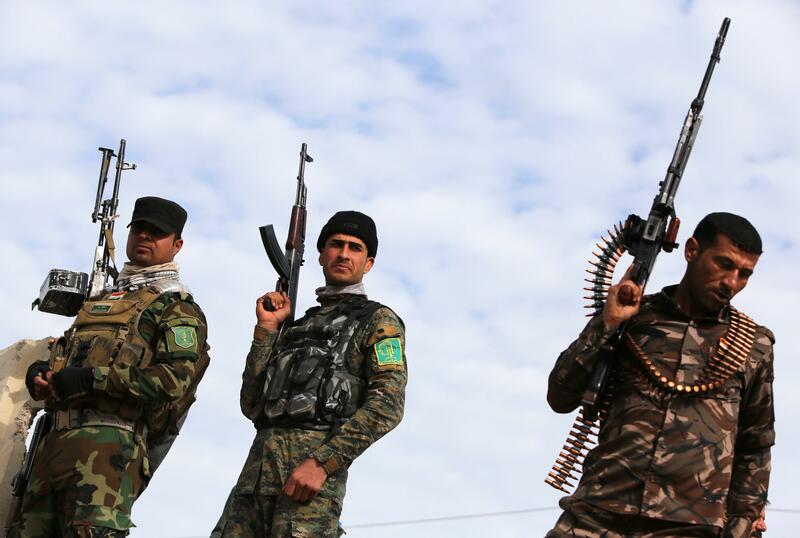 Volunteer Shiite fighters in Anbar province on Feb. 24, 2015. After this past weekend, it’s going to be a lot harder for the U.S. military to claim, as senior officers were until late last week, that ISIS is “on the defensive.” The Iraqi city of Ramadi is now under ISIS control after the last Iraqi security forces fled on Sunday. The loss of the capital of Iraq’s largest province, Anbar, came despite weeks of U.S. airstrikes aimed at heading off the ISIS advance. It’s a bitter defeat for the U.S. military. It was in Anbar, in 2006, that Sunni tribes joined with American forces to rout al-Qaida in the defining success of the military’s “surge” strategy in Iraq. Now, the region is in the hands of al-Qaida’s successor and it’s not immediately clear what can be done about it. Even more worrying than ISIS’s successful offense is how quickly Iraqi security forces abandoned the city. It’s a clear sign that the country’s military is nowhere near ready to take the group on. A lot of the blame for this lies with former Prime Minister Nouri al-Maliki, who (probably intentionally) allowed sectarianism and corruption to hollow out the Iraqi military from the inside to the point that it was easily routed by a vastly smaller group of ISIS fighters last summer. The U.S. hope has been that under a supposedly more inclusive government and a redoubled U.S. training effort, the Iraqi armed forces could be transformed into something capable of at least securing the country’s borders. But that’s clearly still a long way off. U.S. trainers on the ground say Iraqi forces are still in a shocking state of disrepair. It’s not even entirely clear how many Iraqi troops there are: In April the New York Times reported that estimates vary from 50,000 to 140,000, down from more than 280,000 a few years ago. The notable victories in the campaign against ISIS have come at the hands of Iranian-backed Shiite militias or Kurdish Peshmerga forces, backed by U.S. airpower. In the successful battle to retake Tikrit in March, for instance, it was estimated that less than a third of the Iraqi forces were official military and that army commanders were taking orders from the militia. A column of Shiite militia fighters has now been called up by the Iraqi government to retake Ramadi, deep within Iraq’s “Sunni triangle.” Even if they are successful, it will likely deepen the country’s sectarian divisions, increase Tehran’s influence over the country, and feed the Sunni resentment that made it so easy for ISIS to infiltrate Iraq in the first place. Many locals likely don’t see the militias as significantly better than ISIS. The current U.S. strategy for preserving an independent and unified Iraq state and expelling ISIS without committing U.S. ground troops assumes the existence of a cohesive and battle-ready Iraqi military that, for the moment, doesn’t exist. Not surprisingly, the strategy doesn’t seem to be working.